or anything having to do with football. On Monday morning, Philadelphia Eagles fans were understandably verklempt when head coach Doug Pederson announced that Eagles starting quarterback Carson Wentz was out for the season with a torn ACL (anterior cruciate ligament). Wentz had led the Philadelphia franchise to the best record in football (tied with the Pittsburgh Steelers) and was a top MVP candidate for the 2017 season. As soon as Philly fans stopped crying into their greasy cheesesteaks, they began speculating about who the team would sign to replace Wentz. Nick Foles is listed on the depth chart as Wentz’s backup, but he is just one of the many trash quarterbacks collecting checks for sitting on the bench. Foles will likely replace Wentz until Philadelphia realizes that his talent is as nonexistent as Lena Dunham’s jawline. Eliot Shorr-Parks, the Eagles beat writer for NJ.com, places Kaepernick atop the list of available quarterbacks, and the Philly Voice’s Kyle Neubeck wrote that it would be a “disservice” to not even have a conversation with Kaepernick. Even Philadelphia fans are recommending that their team sign the quarterback who led the San Francisco 49ers to the Super Bowl. Kaepernick is reportedly working out and training every day, just in case he gets a call from a team. 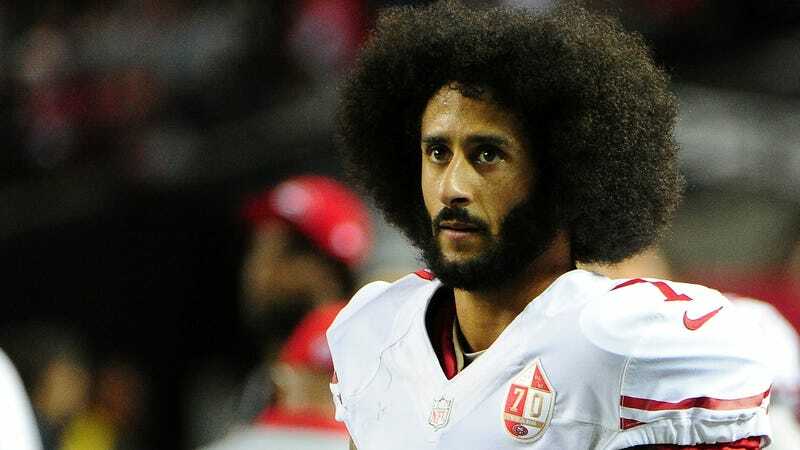 He currently resides in New York City, a short train ride from Philly, and has stayed mum on his plans to continue his protest against racial injustice if he returns to the NFL. 1. They’re protecting the environment: If Kaepernick joined a team and made it to the Super Bowl, can you imagine the superstorm caused by the deluge of warm, salty white tears that would flow all across this country? We don’t have a levee big enough. But Donald Trump would die. His heart would stop pumping his Diet Coke-rich blood through his veins as soon as he heard the news. 3. Maybe Foles is really good: Maybe Foles is an adequate quarterback and could lead the Eagles through the playoffs. Could you back up from your computer for a second? I want to laugh heartily and I don’t want to get any snot on your shirt. Hahahahahahahahahahahahahahah! 4. The NFL is colluding to keep Kaepernick out: The Jacksonville Jaguars have one of the best defenses in the league, a beast at running back and Blake Bortles at quarterback—the second-worst play-caller in the history of the world. (Hillary Clinton’s campaign manager is the worst.) The Minnesota Vikings signed Wes Lunt. I don’t know who he is, but his name is Wesley. Wesley! The Bills’ backup quarterback is so bad, after watching him play, I couldn’t eat Buffalo wings for a week. If that’s not proof of collusion, I don’t know what is. 5. Racism: Nah. Couldn’t be.